Dr. Darlene Lim of NASA Ames, SUBSEA Research Program principal investigator, and Dr. Christopher German of the Woods Hole Oceanographic Institution, SUBSEA deputy principal investigator and science lead for the 2018 expedition, discuss the goals and objectives of the SUBSEA Research Program. Video courtesy of the Ocean Exploration Trust. Download larger version (mp4, 26.7 MB). Exciting new discoveries on Ocean Worlds in our Solar System, in particular on Saturn’s moons Enceladus and Titan and Jupiter’s moon Europa, have helped bring together ocean explorers with interplanetary explorer counterparts. These scientists recognize that terrestrial features and systems on Earth—like hydrothermal vents—could help scientists understand systems that might be similar on the moons of Saturn or Jupiter. Studying these systems on our own planet might even help guide the search for life in space. One result of this growing conversation between terrestrial and interplanetary ocean experts is the SUBSEA (Systematic Underwater Biogeochemical Science and Exploration Analog) Research Program, a new project that will investigate how what we know about the deep ocean can be applied to interplanetary worlds, how our ocean exploration telepresence paradigm might be adapted for use in human-led exploration of other planetary systems, and at a practical level, how ocean explorers can help NASA test instruments and systems destined for outer space in the deep ocean. Now routinely used by terrestrial ocean explorers on vessels such as NOAA Ship Okeanos Explorer and Exploration Vessel Nautilus, telepresence technology uses high-bandwidth satellite connections to allow scientists to add their expertise to missions to explore the deep ocean on Earth no matter where in the world the ship, or the scientists, are located. 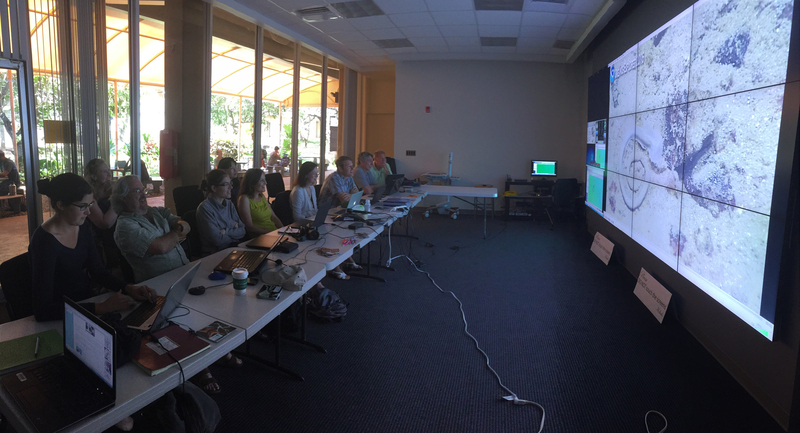 In this photo, scientists at the University of Hawaii Exploration Command Center help guide an Okeanos dive to explore the water column near Malulu Seamount, located more than 4,000 kilometers away. SUBSEA will investigate how this telepresence paradigm might be adapted for use in human-led exploration of other planetary systems. Image courtesy of the NOAA Office of Ocean Exploration and Research. Download image (jpg, 1.1 MB). The SUBSEA Research Program is a partnership between NOAA’s Office of Ocean Exploration and Research (OER) and NASA, as well as the Ocean Exploration Trust (OET) and Woods Hole Oceanographic Institution (WHOI) and other academic institutions. The project blends ocean exploration with ocean worlds research to address knowledge gaps related to the origins of life and the habitability potential of other planets in our Solar System. The SUBSEA team will conduct telepresence-based science to observe, gather instrument data, and collect samples from fluid venting locations at isolated seamounts in the deep ocean as analog environments to hydrothermal systems on other Ocean Worlds. The team will conduct their scientific fieldwork from the OET E/V Nautilus, which is equipped with the Hercules and Argus remotely operated vehicles (ROVs). These ROVs are controlled by (human) pilots and scientists located on board the Nautilus under low-latency feedback conditions (i.e., offering little delay). This on-ship team receives scientific support and exploration direction by a remote, distributed science team located at Exploration Command Centers (ECCs) throughout the U.S. and connected to the ship by a high-speed communications link. The primary ECC for this expedition is at the University of Rhode Island’s Inner Space Center . 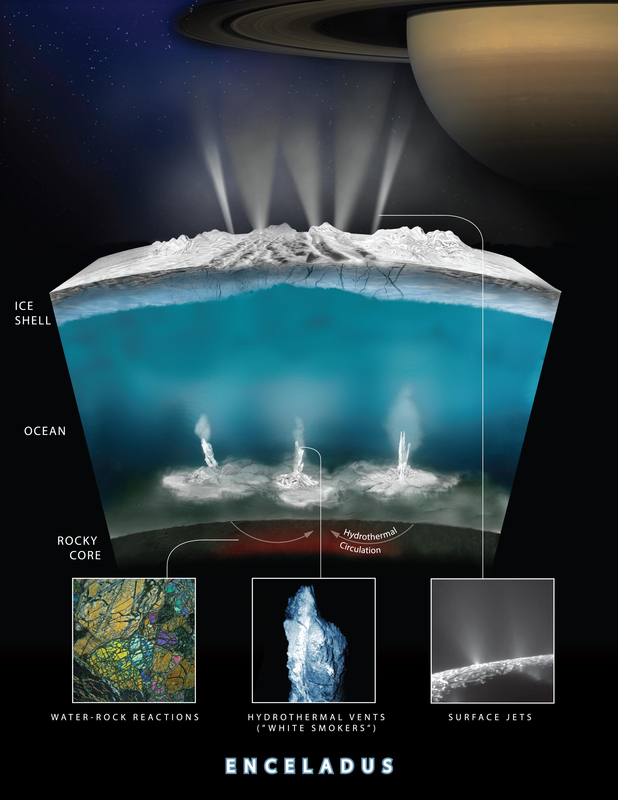 This graphic illustrates how scientists on NASA's Cassini mission think water interacts with rock at the bottom of the ocean of Saturn's icy moon Enceladus, producing hydrogen gas (H2). Image courtesy of NASA/JPL-Caltech/Southwest Research Institute. Download image (jpg, 1.6 MB). During the first SUBSEA expedition, Darlene Lim (principal investigator) from NASA and Chris German (deputy principal investigator) from WHOI will lead an expedition aboard the E/V Nautilus to Lō`ihi Seamount off Hawaii from August 23 - September 11, 2018. By characterizing and systematically sampling across a range of pressures and temperatures at Lō`ihi Seamount, scientists will investigate whether this underwater volcano can serve as an analog of possible hydrothermal systems on the seafloor of Enceladus and other Ocean World systems. Drs. Lim and German are both members of the Ocean Exploration Advisory Board, which advises the NOAA Administrator on ocean exploration issues and has helped to facilitate dialogue between NOAA and NASA. SUBSEA will return to Lō`ihi in 2019 for the second phase of the project: To test applications of typical ocean exploration telepresence operations for use in space exploration scenarios. For example, Drs. Lim and German plan to constrain the telepresence operation on board the E/V Nautilus with artificial latency (or time delay) from ship to shore similar to that from Mars to Earth, while also exploring in low latency from ship to remotely operated vehicle. This is analogous to one model proposed for NASA missions where an astronaut might guide robots on an Ocean World while in orbit around that world (low latency) and remain engaged with scientists on Earth (high latency). Follow along: Throughout the SUBSEA expedition, you can follow discoveries and interact with scientists live via the NautilusLive.org website. The SUBSEA Research Program is funded by the NASA P-STAR Program, with significant infrastructure and in-kind support from the OER and from OET.